John Laurens – It's Hamiltime! This is the first of a two part series on Hamilton’s interactions with General Charles Lee. Look out for part two next week! On 28 June 1778 the British and American forces engaged near Monmouth, New Jersey. 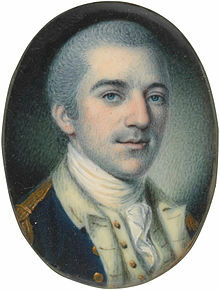 The battle occurred when Maj. Gen. Charles Lee retreated unexpectedly after briefly engaging with the British as the British removed themselves from the village of Monmouth Courthouse. When Lee’s troops retreated towards the main body of the American forces, the British troops under Gen. Sir Henry Clinton followed close behind. Despite the great confusion resulting from the unexpected retreat, the American forces repelled the British advances. The events surrounding Lee’s retreat and Washington’s reaction to that retreat precipitated Lee’s eventual court martial, as the Lee-Washington letters make clear. On July 4, 1778, the court martial proceedings against Lee began. The court martial proceedings began on July 4, chaired by Lord Stirling, in a tavern at New Brunswick. The general officers present were Jedediah Huntington of Massachusetts, Enoch Poor of New Hampshire, William Smallwood of Maryland, and William Woodford of Virginia. None of these officers had been in the thick of the fighting on June 28. First: For disobedience of orders, in not attacking the enemy on the 28th of June, agreeable to repeated instructions. Secondly: For misbehavior before the enemy on the same day, by making an unnecessary, disorderly, and shameful retreat. Hamilton testified against Lee twice, once on July 4, 1778 and then again on July 13th. At the court martial, Lee was permitted to ask questions to challenge the witnesses against him. Hamilton’s role in these proceedings is documented in his papers. On July 4, Hamilton was asked questions centered on what orders from General Washington were communicated to Lee. Hamilton had actually written the letter communicating Washington’s orders to Lee, and testified to his memory of the contents of the letter because no copy was available. At the second session of Hamilton’s testimony, on July 13th, Hamilton gave his perspective of what happened at the Battle of Monmouth, and the interaction between Washington and Lee on the field. First, Hamilton stated that Lee’s troops had not attacked the enemy, except for small attacks by two small groups of troops, one of which Hamilton proposed to Lee. Hamilton testified that he watched Washington give Lee a direct order to remain and fight. Lee had accepted these orders and told Washington hat he would not be the “first man to leave the field.” However, even after this exchange, Lee directed his troops to fall back. The sentence of the court was Lee’s suspension from the army for a year. The sentence was forwarded to Congress. Congress agreed to the court’s decision by a close vote, thirteen to seven, on December 5, 1778. After his court martial, Lee let his discontent simmer and publicly complained of Washington’s poor leadership. He published a Vindication to the Public, with his version of events to defend his reputation. Charles Lee subsequently published what he called a ‘ ‘ Vindication to the Public, ‘ ‘ which was an able bit of special pleading and convinced some readers that he was a martyr, but which otherwise fell flat. This set the stage for a showdown involving Lee and Washington’s loyal aides and supporters, Hamilton and John Laurens. The contempt we have been taught to entertain for the blacks, makes us fancy many things that are founded neither in reason nor experience; and an unwillingness to part with property of so valuable a kind will furnish a thousand arguments to show the impracticability or pernicious tendency of a scheme which requires such a sacrifice. But it should be considered, that if we do not make use of them in this way, the enemy probably will; and that the best way to counteract the temptations they will hold out will be to offer them ourselves. An essential part of the plan is to give them their freedom with their muskets. This will secure their fidelity, animate their courage, and I believe will have a good influence upon those who remain, by opening a door to their emancipation. This circumstance, I confess, has no small weight in inducing me to wish the success of the project; for the dictates of humanity and true policy equally interest me in favour of this unfortunate class of men. In the book Black Patriots and Loyalists, Alan Gilbert describes the role of black soldiers in both the Loyalist and patriot cause. The British actively recruited black soldiers, with Lord Dunmore’s November 1775 proclamation. The proclamation stated that all indentured servants and slaves “free” who were “able and willing to wear arms.” While black soldiers had been part of the colonial militias, Washington had refused to accept them into the official Continental Army. However, Lord Dunmore’s proclamation prompted Washington’s decision to finally accept black soldiers in the army on December 31, 1775. In 1781, during the Battle of Yorktown, when Hamilton was commanding a battalion of troops under Lafayette, Lieutenant Colonel de Gimat’s battalion was composed of a majority of black soldiers. By 1779, 15% of the Continental Army and colonial militias were made of men of African decent. They saw action in every single major battle including Ticonderoga, Monmouth, Valley Forge, Princeton, and Washington’s Delaware crossing. Despite the opposition of his contemporaries, and Washington’s initial refusal, Hamilton and Laurens persisted in advocating for the acceptance of black soldiers into the Continental Army. Hamilton’s responses to the racist views of his contemporaries foreshadowed his lifelong commitment to the cause of abolition. In sharp contrast to the blatant racism of “Enlightenment” thinker Jefferson, Hamilton never wavered on his philosophical opposition to slavery.